Whenever I am asked, “How long can I expect a hard drive to last?” I reply with, “How often do you back up your data?” This seeming non sequitur perplexes people, but I have found that the answer to my question is, almost invariably, the reason the first question is asked. The questioner is wondering how much longer he/she can get away with not backing up data. Technobabble about MTBF (Mean Time Between Failure) in the 50,000 to 100,000 hour range is useless. Those hours are active hours during which the read/write head of the drive is moving. You have no way to monitor and record read/write head activity and you don’t want to be bothered doing so unless you’re a test engineer for a hard drive manufacturer. Furthermore, MTBF measures mean (average) time before the hardware fails catastrophically, as in “won’t spin anymore.” That is the very last thing that will go wrong with a hard drive, akin to throwing a rod in your car’s engine. Long before the hardware fails catastrophically, you will be experiencing losses of data, and you might not even notice that it's happening. When data is written to a drive, the magnetic charge of tiny areas of the physical disk is altered. One magnetic state means “0” or zero, the other means “1” or one… or on/off, if you prefer. The patterns of this binary code store your data as a collection of magnetized spots in one state or the other. In order to make the disk reusable, the magnetic state of each spot on it must be changeable. A lot of things can change that magnetic state beside the drive’s read/write head. A strong magnetic field near a drive can scramble data. Power blips can cause a read/write head to write (change the magnetic state of a spot) instead of read, overwriting data with gibberish. Even cosmic rays can penetrate any computer case and zap the data on a hard drive, although a cosmic ray is so narrow it will probably affect only one or a handful of data spots. You don't believe in cosmic rays? Fine. Natural disasters like fires, floods, hurricanes and tornados also tend to dramatically shorten the lifespan of a hard drive. Even if your brand-new 2 terabyte hard drive has no manufacturing defects, it won't last long in an F5 tornado packing 200 MPH winds. And of course, there are well-known threats from viruses, botnets, and ransomware. So a hard drive is in constant danger of having all or part of its data either erased, corrupted, destroyed, or otherwise rendered unreadable. It doesn’t matter if the drive is fresh out of the box or nearing its MTBF. What Studies Have Been Done on Hard Drive Life Expectancy? A study on hard drive longevity was conducted by Backblaze, an online backup provider that has more than 25,000 consumer-grade hard drives in service. They found that 78% of the drives they use are lasting longer than four years. That might sound good, but it also implies that 22% of hard drives fail in the first four years. The Backblaze study identifies the three most common causes of drive failure: factory defects, random failures, and parts that wear out. The failures due to factory defects tend to happen in the first 18 months of service. Failures due to wear out start to increase much faster after the three-year point. The Backblaze study has been ongoing for four years. Other hard drive studies done by Google and Carnegie-Mellon University have been five-year spans, and both were conducted in 2007. So there just isn't an authoritative answer as to how long a hard drive will last. Backblaze has some stats that give them confidence to predict that more than half of all drives will last six years. I think you'll find their report interesting. Let me summarize and pontificate a bit. One in five hard drives will fail within four years. Failure rates start to jump after three years. And there's a 50/50 chance your drive will last six years. Does that give you a warm fuzzy feeling? I'd rather not rely on luck and statistics. My advice is simple... why take chances? It's vital to back up your data regularly and not just whenever you don’t feel like doing something else. Regular, automatic backups are the best defense you have against loss of data. See the sidebar for my recommendation of an external hard drive that makes it super-easy to get the job done. Most recent comments on "How Long Will Your Hard Drive Last?" The average time before failure includes some brands of hard disk drives (HDD) that simply are not built with the quality in them of the major manufacturers. Even the technology of the minor-named brands is inferior and should never be expected to last. If you want a cheaper drive, expect lower performance and shorter life. While it is true we seem to change computers more frequently than we realize a hard drive failure, I can say I have never had to use one of my monthly full image backups to recreate a failed HDD. My oldest working computer is a 1998 one with the original drive in it. This same failure rate then applies to a back-up hard drive as well does it not? Then it applies to the cloud back-up also. The only more reliable back-up medium then appears to be a solid state drive. Bob, I completely agree with your answer re: the life expectancy of HDDs. Every PC of mine is a business MT with at least two internal 3.5 HDDs and each MT has an external drive. But after twenty years in institutional IT, each organization with tens of thousands of PCs, I have to question the significance of overall averaged statistics regarding the lifespan of HDDs. These studies are like an averaging of human lifespan which includes everyone from the extraordinarily healthy and fit, living in the best and most controlled environments, to those struggling to survive in a pandemic in a war zone. This averaging, misunderstood, can produce the illusion that the privileged are in greater danger than they really are, and the war-tossed in less. Every HDD company offers grades of drives, and the higher grades are much more reliable, a different class of technology. Next there’s class difference between the drives that come in business/institutional computers (Dell OptiPlex and Precision, Lenovo ThinkCentre M, HP Elite and Pro) - whose choices of HDDs and terms of warranties are based on extensive, long-term records of what lasts how long, and why - and the lesser HDDs in home and mass market computers. Then there are bad manufacturing lots, often in the thousands, sometimes in the tens of thousands, sometimes even regional, such as caused by flooding in Southeast Asia. Then there’s environment – heat, shock, vibration, condensing humidity, improper installation, and electrical malfunction, and the consideration that 3.5 HDDs are more reliable than 2.5, since the 2.5s are more susceptible to the same environmental factors, and more delicate, but more frequently subjected to higher absolute and relative levels of heat, shock, and vibration resulting from inferior cooling, inferior maintenance, and greater risk of physical force through accidents. Bottom line, I agree that we shouldn’t assume anything about the lifespan of HDDs, especially with important information. I sure don’t. But there’s a whole galaxy of difference when we use better products properly. @ Therrito...I maintain multiple computers for various users...For SoHo applications, my experience has been that Hitachi drives last longer than WD; which lasts longer than Seagate. Toshiba and Fujitsu are in the upper 90% also. RE: Mike K: The average life for a external drive used for backup is likely less because of the risks of separate handling. Cloud failure is really unlikely due to disk failure because of mirroring backup where you would never know a failure occurred. SSD is subject to failure so it is not the most reliable of all choices for backup. I think the requisite caution about regular backups is always good but shouldn't dominate the post. It would have been better to have covered the exact topics covered in the comments. I have found SSDs have gotten much better but I have picked up a few 256s as a C drive that died in a couple weeks. My experience over the years for SoHo drives has been good with WD having had almost no failures in dozens of drives. A little more cautious with Seagate so not much history. Not a lot of Hitachi history. Did they buy someone in the past? Is this now HGST? I really wish MS would provide support for splitting the OS on a separate drive from programs/apps and user data. I know it's doable, I do it, but it's harder in W10 and the only support is on web blogs. This makes for better backups. I use Macrium Reflect. Easy and complete. I found Acronis impossible to use. I've never had a hard drive fail. Yet, my backups (have 3 external hard-drives, that I rotate) have saved me several times, because of a wide-spread, very common problem. If it hasn't affected you yet, just wait, it will. What's the problem, you ask? It's the dreaded PEBKAC!! (Problem exists between keyboard and chair). My backups have saved me every time! Something that I’ve never seen mentioned is failure of the interface PCB. In the past 27 years I only had three HDs fail due to hardware issues. However, I’ve had about 10 rendered useless due to failure of some component on the PCB. @BobD Any halfway decent computer shop can test HDDs and SSDs. So can you, for that matter, using free software. It isn't rocket science. I test every new drive I get. No matter how good the shop or the software, it's impossible to predict drive life with 100% accuracy and only a solid backup scheme can reasonably ensure the safety of your data. @Mike I disagree with much of what you have posted here. First, there is nothing wrong with using SSDs for backups. In fact SSDs are now much more reliable than HDDs. SSDs aren't subject to damage from physical shock (drop an HDD and you can probably kiss it goodbye) or parts wearing out. Despite the fact SSDs do have a finite write life, with the ones made in the past five or so years, it is high enough that you are extremely unlikely to wear one out before you upgrade it to newer technology or one of higher capacity. WD bought up parts of Hitachi and renamed it HGST. 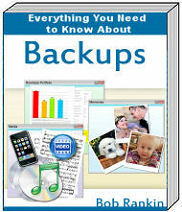 If people would backup their data, there would be no need to harp on the importance of backups. However, very few people do backup their data or often mistakenly think that using a RAID is a backup. Hence, the need to keep emphasizing the need for backups. @BobRankin Automatic backups are an extremely bad idea since they require that a backup drive be kept connected to the computer, subjecting them to many of the same dangers the drives in the computer are subjected to, such as malware and user error. Backup drives should be connected to a computer only while updating the backup. other wise, they should kept disconnected from the computer and powered down and stored away from the computer. Ideally, one should have at least two backups of each drive: one kept onsite and one kept offsite (although even only one backup is better than none). One has to discipline themselves to manually update their backups, the same as one has to remember to have one's cars serviced. The comparison between "consumer" and "enterprise" hard drives was not raised. If you are not consistent with your backups enterprise drives may be for you, they are generally built to higher tolerances than consumer drives. Yes they cost more, but you get what you pay for. I have three Seagate ES.2 1TB drives that have been running just fine for 8 years now. I believe that with the rapid price decline in SSDs, within two to three years, the price of an aftermarket 1TB SSD will probably be under $100.00, and in five years they will be going for what a typical HDD is retailing these days - in the $40.00 to $55.00 range. I also expect to see within two years, typical desktop computers shipping from the factory with 500 to 700 GB SSDs as standard equipment, and 1 TB units to be standard within a year or two after that. At that point, the era of the HDD will be over, except for those units in the 4+ TB range. @Paul: Do the "commercial" series of HDDs really have better parts and are built to 'higher tolerances," or do they basically the same as the consumer editions, but with a longer factory warranty? I've been told by techs at several computer stores that, for example, the difference between the WD 'Blue Label' series (consumer) and the WD 'Black Label" series (commercial/enterprise) is minimal, except for the factory warranty, which, in the case of the Blue series, is one year, while the Black series is covered for three years, which accounts for the typical $20 to $30 upcharge for models from the Black series versus comparable sized units from the Blue series. @Robert A. WD Blues have a two year warranty and the WD Blacks have a five year warranty. @Robert A. Btw, WD Blacks are a performance, consumer grade drive. There is a considerable difference between the WD Blues and the WD Blacks. Just hold a Blue in one hand and equally sized Black in the other and just the weight difference will be very noticeable. Also, the Blues are 5400 rpm drives and the Blacks are 7200 rpm drives. One thing to keep in mind is that these MTBF tests are invariably done in laboratories or commercial settings, under ideal conditions (temperature, humidity, handling, power conditioning, etc.). In the consumer world, conditions vary from ideal to absurd. Although the disks will probably be used less frequently by a user at home, the environment will play a bigger role. So, I would like to see a breakdown on what caused those failures - simple wear, or heat, surges, etc. 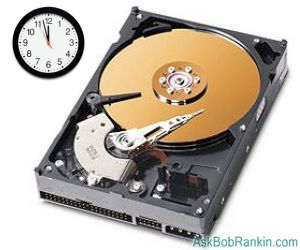 Over the last 20 years, after troubleshooting computers and returning them to customers, many asked how long they might expect their hard drives, monitors, etc. to last? I told them a few of the things Bob mentioned - but mostly that there's too many factors, to answer with any degree of accuracy. However, since vibration and heat are no friends of any computer components, it would certainly help to turn them off at the end of the day... and of course not dropping their notebooks or kicking their desktop towers with a nervous foot, would also go a long way towards helping their hard drives spin a bit longer. From personal experience, I keep everything backed up to multiple sources (my preference is full imaging, keeping several snapshots in time, on hand). Actually, I still have several functional hard drives (now set up as external portable drives) taken from my computers (that quit for other reasons) years ago. They're used as needed to retrieve old data still on them, periodically. Once, 15 years ago I had to replace one of my notebook hard drives when it started getting sloppy on read/writes and the high error rates slowed access times to a crawl. To this day, I regularly use a 10 year old Sony Vaio notebook (which has been running flawlessly with a Seagate 750 GB Hybrid that I put in it, when they first came out) and a 7 year old Acer Aspire (which has been running great with a Seagate 500 GB Hybrid that I put in it, when those first came out). If there's a moral hidden anywhere here, I suppose it might be "Assume nothing and back up everything that's important to you." Bob,I was all set invest in the I-Drive 1 until I got to the part of a monthly commitment for a cloud service I do not really need. I stopped with term and conditions. If that fine piece of hardware does not come without or work without the cloud service, then this is really no bargain at all. I might as well just get an external drive and relocate my modem where I am having signal strength problems. EDITOR'S NOTE: The cloud service is optional, and you will owe nothing more if you cancel it within the first 12 months. Of course, the IDrive is yours to keep if you don't want the cloud service, and it can be used with any backup software you like. @Jim Rapp I so totally agree with you! I abominate CAPTCHAs with a purple passion, even the ones where you click on pictures. Those misbegotten things can range from fairly easy to downright impossible to solve. I would like to meet the sadist who invented the evil things and have a "discussion" with him. I recently registered to a product help forum and it took me over twenty minutes to come up with a password to meet their excessively paranoid security standards and to get past the despicable picture CAPTCHA (mostly, the latter). Hi Bob, a very interesting article. Purchased my ASUS K52F laptop in August 2011 and haven't experienced any hard drive problems and the laptop is programmed to do automatic backups. Some time last year, the CD-ROM wouldn't read the capacity of CD's/DVD's, but played them OK.
After reading up on the internet on how to repair the matter, which was to spray the disc player with CO Contact Cleaner, a supposedly precision electronic cleaning solvent. Yeah sure, the CD-ROM wouldn't play at all after that, had to go out and buy a portable disc player. So much for the expert help on the 'net'. I should have replied back to the author of that recommended repair and told him, his method cost me the use of my disc player. When my portable disc player finally stops reading the capacity of my CD's/DVD's, I'll read and note down the capacity of each file on the disc, tally up the total to see how much disc space used up, which I should have done when using my original in-built CD/DVD player. OK, won't bore you with too much more and sorry to have wandered off the hard drive topic. May you have a nice day. My *only* experience with Western Digital (WD) was miserable as well as expensive. Just a week after the warranty expired, the drive "died," taking all data with it. I was younger and less experienced then, but now I have more than one backup device and manually backup on a more-or-less regular schedule but not both devices at the same time: overlapping protection. WD: you like it? You can have it. Combined with Hitachi or whatever, I won't trust my data to WD ever again.